In 1952, the American cosmetics industry was poised to explode. After the privations of wartime, women everywhere clamored for the color lipstick, nail polish and make-up that defined Hollywood glamor. Jack Ostrower, a New York City tannery expert with a specialty in lamb’s wool, was ready to play his part. Armed with samples he had stitched himself, he approached Fabergé with a new lamb’s wool puff for body dusting powder. 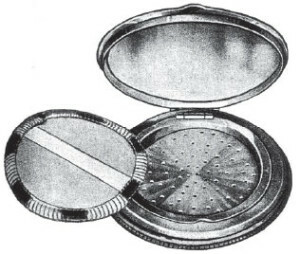 The puff would transform Fabergé powders from “under the counter” items to a luxury gift, showcased in sensuous, transparent boxes. Public response was overwhelming, and soon other industry leaders sought out similar fur puffs for their lines. Color cosmetics continued to evolve, demanding newer and more varied applicators. Ostrower’s Penthouse Group, which grew to include his son William and grandsons Steven and Dan, soon became the dominant player. In 1966, there were more than 25 makers of puffs in the United States; today, The Penthouse Group is North America’s only manufacturer. Its innovative introductions have included lamb’s wool puffs, cotton velour puffs, low-cost synthetic lamb’s wool puffs (Orlon), lamb’s wool paddles for pressed powders, sewn puffs, luxurious flocked foam puffs and powder-filled powder puffs (historically known as Powder Balls). In the mid-1960s, The Penthouse Group developed and introduced a revolutionary new product: foam-tipped applicators for eye shadow. Billions have been produced, and today the applicator is the industry standard worldwide. Beginning in the 1980s, the company began partnering with leading-edge companies in Japan and elsewhere to introduce new products to the American market. The first was a unique cosmetic sponge of a synthetic latex blend called Yukilon®. Introduced with the first Wet-Dry make-up by Revlon, Yukilon® revolutionized the U.S. cosmetic market as the first long-lasting, oil-resistant, antibacterial-treated and hypoallergenic cosmetic sponge. A proprietary blend exclusive to The Penthouse Group, Yukilon® has been often imitated but never duplicated, and remains the world leader today. Later introductions have included new generations of sponges; natural and synthetic-hair brushes; grooming tools and kits; luxury cosmetic packaging, tubes and components by Yoshino of Japan; and cost-efficient stock cosmetic packaging. Today, The Penthouse group is a global leader in innovation and quality manufacturing, proudly serving the largest and most sophisticated cosmetic companies in the world.